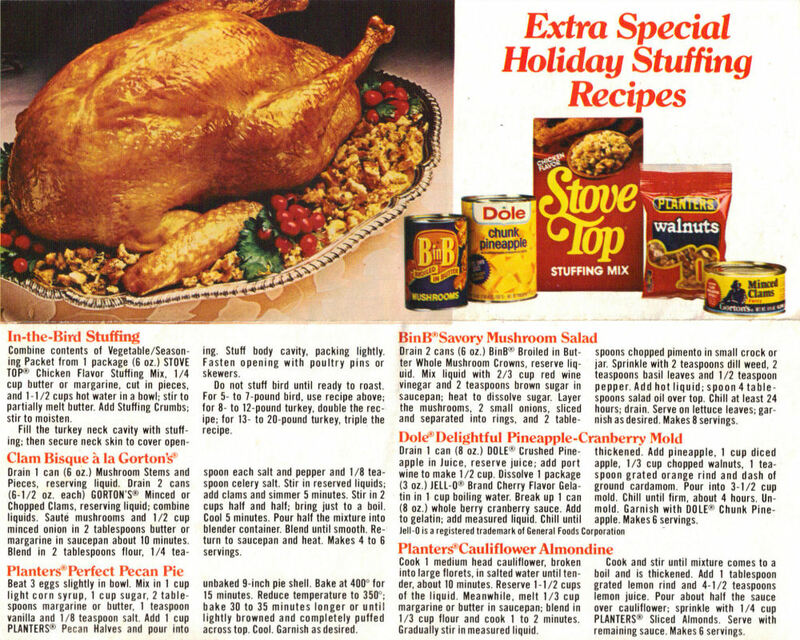 This promo recipe sheet from Stove Top Stuffing was found in a large collection, date unknown. 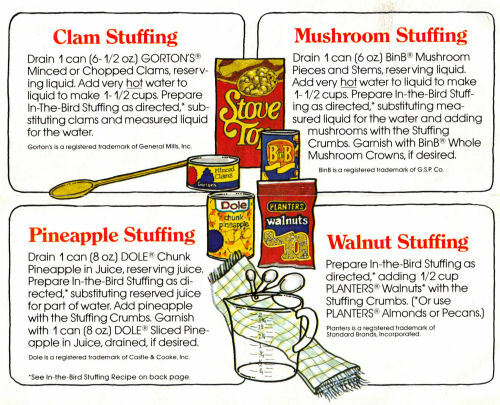 There are a few recipes for stuffing as well as assorted holiday recipes (pecan pie, clam bisque, mushroom salad, pineapple-cranberry mold, cauliflower almondine). Recipes are typed below along with scanned copies of the recipe sheet (the bottom recipe page is clickable if you’d like to view a larger size). Drain 1 can (6-1/2 oz.) GORTON’S Minced or Chopped Clams, reserving liquid. Add very hot water to liquid to make 1-1/2 cups. Prepare In-The-Bird Stuffing as directed,* substituting clams and measured liquid for the water. Drain 1 can (6 oz.) BinB Mushroom Pieces and Stems, reserving liquid. Add very hot water to liquid to make 1-1/2 cups. Prepare In-the-Bird Stuffing as directed,* substituting measured liquid for the water and adding mushrooms with the Stuffing Crumbs. Garnish with BinB Whole Mushroom Crowns, if desired. Drain 1 can (8 oz.) DOLE Chunk Pineapple in Juice, reserving juice. Prepare In-the-Bird Stuffing as directed,* substituting reserved juice for part of water. Add pineapple with the Stuffing Crumbs. Garnish with 1 can (8 oz.) DOLE Sliced Pineapple in Juice, drained, if desired. Combine contents of Vegetable/Seasoning Packet from 1 package (6 oz.) STOVE TOP Chicken Flavor Stuffing Mix, 1/4 cup butter or margarine, cut in pieces, and 1-1/2 cups hot water in a bowl; stir to partially melt butter. Add Stuffing Crumbs; stir to moisten. Fill the turkey neck cavity with stuffing; then secure neck skin to cover opening. Stuff body cavity, packing lightly. Fasten opening with poultry pins or skewers. Do not stuff bird until ready to roast. For 5- to 7-pound bird, use recipe above; for 8- to 12-pound turkey, double the recipe; for 13- to 20-pound turkey, triple the recipe. Drain 1 can (6 oz.) Mushroom Stems and Pieces, reserving liquid. Drain 2 cans (6-1/2 oz. each) GORTON’S Minced or Chopped Clams, reserving liquid; combine liquids. Saute mushrooms and 1/2 cup minced onion in 2 tablespoons butter or margarine in saucepan about 10 minutes. Blend in 2 tablespoons flour, 1/4 teaspoon each salt and pepper and 1/8 teaspoon celery salt. Stir in reserved liquids; add clams and simmer 5 minutes. Stir in 2 cups half and half; bring just to a boil. Cool 5 minutes. Pour half the mixture into blender container. Blend until smooth. Return to saucepan and heat. Makes 4 to 6 servings. Beat 3 eggs slightly in bowl. Mix in 1 cup light corn syrup, 1 cup sugar, 2 tablespoons margarine or butter, 1 teaspoon vanilla and 1/8 teaspoon salt. Add 1 cup PLANTERS Pecan Halves and pour into unbaked 9-inch pie shell. Bake at 400° for 15 minutes. Reduce temperature to 350°; bake 30 to 35 minutes longer or until lightly browned and completely puffed across top. Cool. Garnish as desired. Drain 2 cans (6 oz.) BinB Broiled in Butter Whole Mushroom Crowns, reserve liquid. Mix liquid with 2/3 cup red wine vinegar and 2 teaspoons brown sugar in saucepan; heat to dissolve sugar. Layer the mushrooms, 2 small onions, sliced and separated into rings, and 2 tablespoons chopped pimento in small crock or jar. Sprinkle with 2 teaspoons dill weed, 2 teaspoons basil leaves and 1/2 teaspoon pepper. Add hot liquid; spoon 4 tablespoons salad oil over top. Chill at least 24 hours; drain. Serve on lettuce leaves; garnish as desired. Makes 8 servings. Drain 1 can (8 oz.) DOLE Crushed Pineapple in Juice, reserve juice; add port wine to make 1/2 cup. Dissolve 1 package (3 oz.) JELL-O Brand Cherry Flavor Gelatin in 1 cup boiling water. Break up 1 can (8 oz.) whole berry cranberry sauce. Add to gelatin; add measured liquid. Chill until thickened. Add pineapple, 1 cup diced apple, 1/3 cup chopped walnuts, 1 teaspoon grated orange rind and dash of ground cardamom. Pour into 3-1/2 cup mold. Chill until firm, about 4 hours. Unmold. Garnish with DOLE Chunk Pineapple. Makes 6 servings. Cook 1 medium head cauliflower, broken into large florets, in salted water until tender, about 10 minutes. Reserve 1-1/2 cups of the liquid. Meanwhile, melt 1/3 cup margarine or butter in saucepan; blend in 1/3 cup flour and cook 1 to 2 minutes. Gradually stir in measured liquid. Cook and stir until mixture comes to a boil and is thickened. Add 1 tablespoon grated lemon rind and 4-1/2 teaspoons lemon juice. Pour about half the sauce over cauliflower; sprinkle with 1/4 cup PLANTERS Sliced Almonds. Serve with remaining sauce. Makes 6 servings. Hi. Stumbled on this site through pinterest. 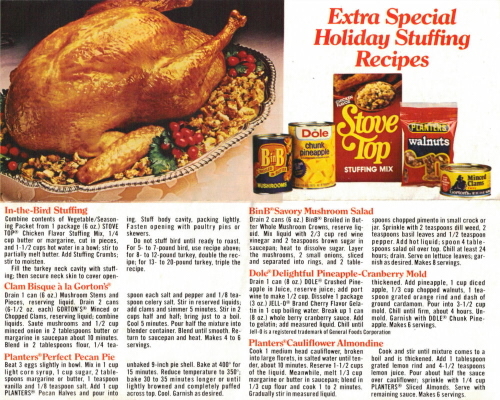 I’m looking for a stove top stuffing recipe from the box in the early 90s. It was a casserole-style with a layer of spinach and sour cream (and…)between layers of stuffing. Any chance you have run across it? Thanks!